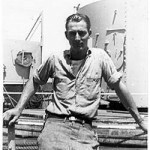 Please go here for some recently uncovered photos of the mine damage supplied by the family of BTC Jack Ray Huffman. 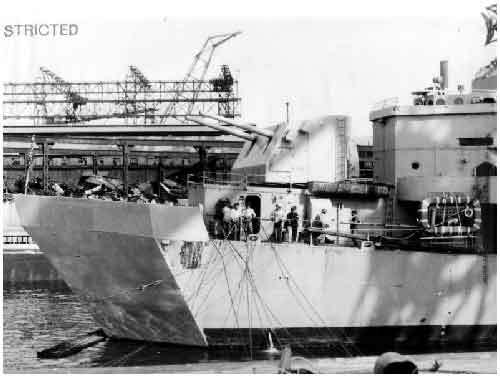 The USS MANSFIELD, a unit of DesRonNINE, was under the operational control of ComTaskGrp 95.2 (ComCruDiv in HELENA) upon departure from Sasebo, Japan on 26 September 1950. 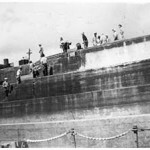 The ship proceeded with the Task Group, consisting of the HELENA, MANSFIELD and L.K. 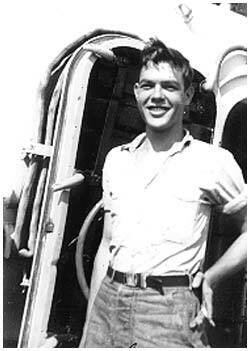 SWENSON, to the East Coast of Korea for blockade and gunfire support duties. 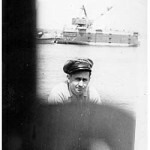 En route a rendezvous was made with the USS BRUSH, which was returning to port following mine damage, and other blockade ships in her company (USS WORCHESTER, USS DEHAVEN, USS BOLSTER). 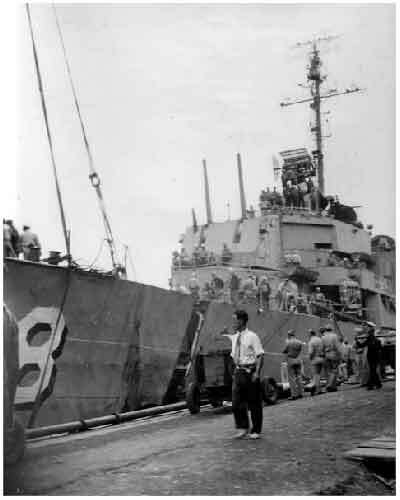 For the next three days and nights the MANSFIELD was accompanied by the USS SWENSON in providing a coastal traffic block at points up to Chumunjin Lat 37°56’N. 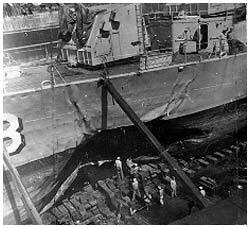 Interdiction gunfire was carried out at night but no enemy traffic was indetified. 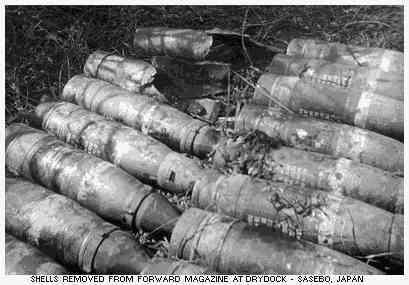 The rapid advance of the ROK forces northward up the coastal highway, at this time, required great caution in selecting shell fire targets. 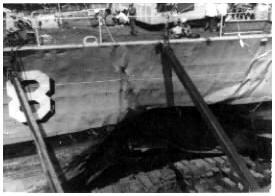 The task was rendered more difficult by an operation order to remain outside of the 50 fathom curve due to suspected mines in the area. 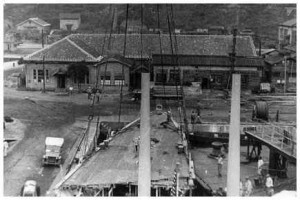 However, by observation and speaking to the coastal fishing boats waving ROK flags, and exchange of intelligence with other ships of the task group the gunfire targets were delineated safely. 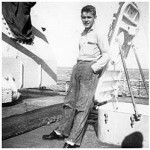 In addition to the L.K. 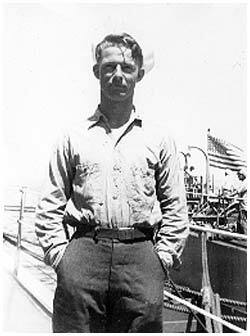 SWENSON in company with the MANSFIELD, the task group ships in the coastal area included the USS HELENA, USS ENDICOTT, USS S.N. 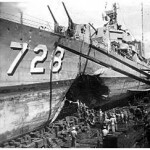 MOORE, USS THOMAS, and USS MADDOX with ComDesDiv 92 embarked. About 1230I on the 30th, an urgent dispatch directed the MANSFIELD and SWENSON to proceed at best speed possible to Lat 38°45’N, Long 128°15’E to assist a B-26 aircraft reported down at that point. The distance was about 60 miles north of the MANSFIELD. 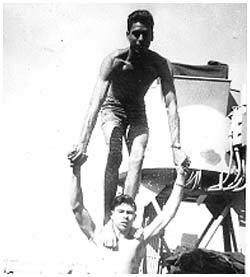 At 1445I the ship went to General Quarters and set Material Condition Able, executing this routine exercise with more thatn usual vigor upon hearing from the SAR plane on the scene that small arms fire had been received from the beach. 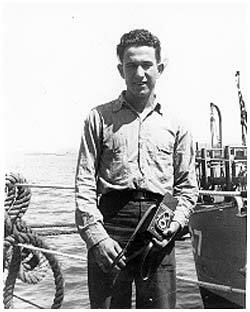 At 1450I the ship reported on the scene and commenced searching. 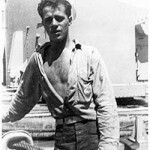 At 1500I, with the L.K. 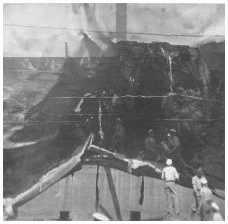 SWENSON lying to outside the 50 fathom curve, to cover our approach, the entry to Choson Ko begun. 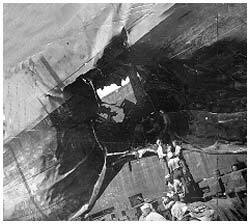 The approach was made at slow speed, heading so that the reported position of the plane wreckage would be on the starboard bow. A second plane was now on the scene, a B-178 with a rescue boat. 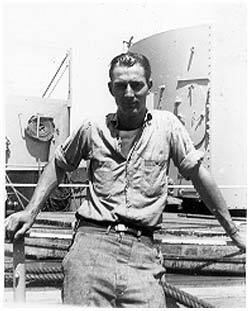 The SAR plane, when requested to make another pass over the wreckage it had reported approximately 500 yards east of Toi To Island, again drew machine gun fire which could clearly be heard on the ship. 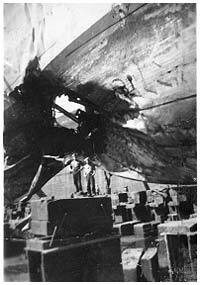 Suddenly, a high order explosion was soon heard under the bow of the ship. 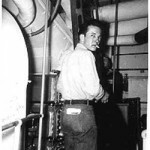 A geyser of water rose up on the port side to the height of the gun director. 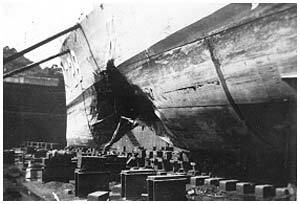 While many of the watch were temporarily stunned by the detonation, the Commanding Officer backed both engines full. 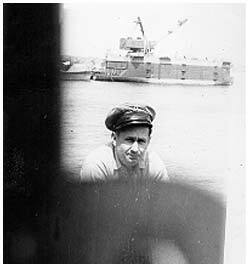 The ship was steered, while backing, through the same water she had entered. 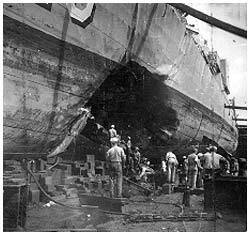 The engineering officer promptly left his station at repair central and rushed forward to begin damage control and rescue injured personnel. 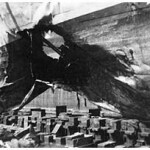 The bow was clearly observed to be sinking as soon as the explosion subsided. 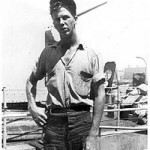 After backing clear to the vicinity of the L.K. 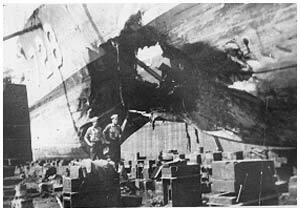 SWENSON, a distance of about 4 miles, engines were stopped and an account made of the casualties and damage. 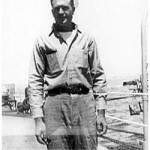 Radio reports were sent to cognizant commanders. 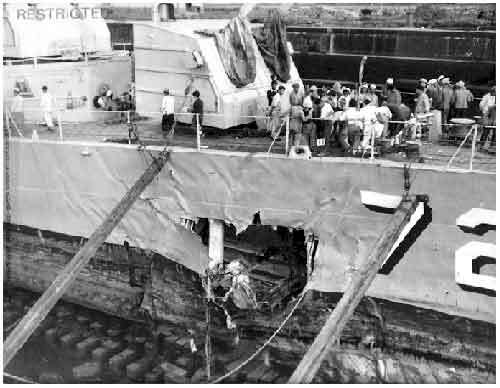 Early analysis of the damage accurately established the water tight bulkhead forward at frame 48. 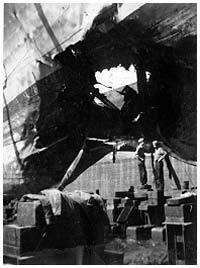 This bulkhead was shored while wounded were carried to the battle dressing station in the wardroom. 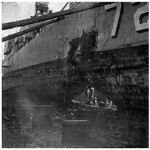 the Commanding Officer called repeatedly for an estimate of casualties particularly dead and missing. 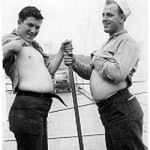 Finally an all hands muster on abandon ship parade confirmed the previous on-battle-station muster of NONE missing or dead. 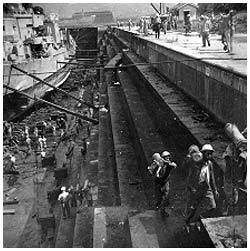 After this cheerful report was passed to all hands, the work of treating the twenty-eight wounded, of building shores, and of pumping tanks proceeded with greater expedition. 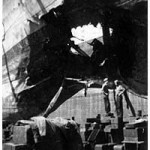 Three weeks after the explosion the fact that not a man was lost of even crippled remains a miracle. 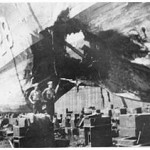 The labors of the MANSFIELD repair parties in this action are worth of note. 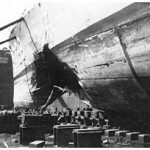 The bow was clearly observed to be sinking, the damage control parties first efforts were to remove the wounded and shocked, them to determine the extent of the damage. 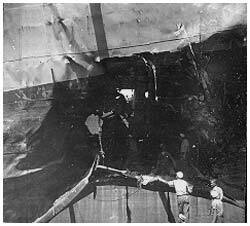 The party penetrated the smoke and debris forward on the main deck and found that level relatively undamaged. Then thy tested the first platform deck, finding that deck above water but badly holed in the CPO mess room. 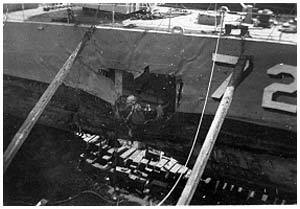 When an attempt was made to go below that deck, the compartments were found to be flooded to a depth of several feet. 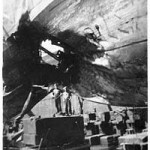 Thus it was quickly determined that the first platform and the bulkhead at frame 48 was the water tight boundaries, and shoring was immediately begun on all decks. 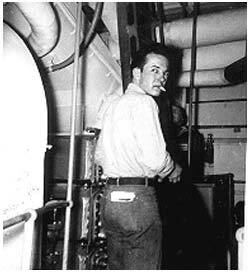 The wood shores provided on the ship were used early in this emergency, and in searching for more material for such use, the awning stanchions and magazine stowage supports proved of ideal value when set in place with a welding torch. 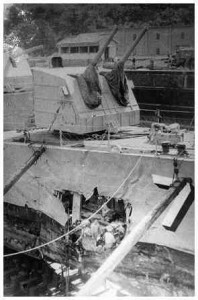 As no free-surfaced tanks were permitted in the accordance with standard instructions, the only need immediately evident was to pump forward tanks empty and after tanks full to keep the bow trim up. 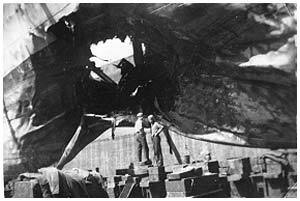 This was accomplished in short order using the emergency tank ejectors. 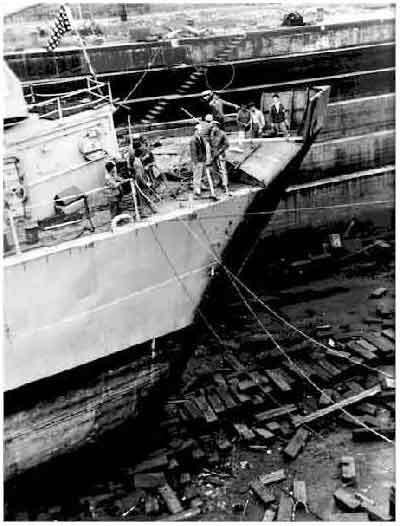 The port anchor was jettisoned, resulting in a 3-4 inch rise of bow trim. 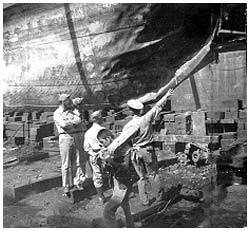 Shoring of the deck with vertical welded stanchions was carried on. 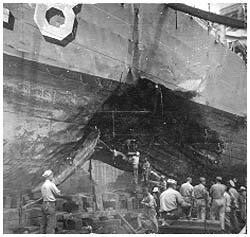 It is believed these damage control methods contributed much toward saving the damaged bow section. Please visit George’s website for more first hand accounts of his Navy days during the Korean War. 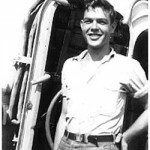 1227 Departed area of Point “Easy”, Lat 37°56’N, Long 128°54’E, in company with USS LYMAN K. SWENSON DD729 proceeding at 25 knots to a point Lat 38°45’N, Long 128°15;E, to investigate a report of a downed American B-26 in accordance CTG 95.2 instructions. 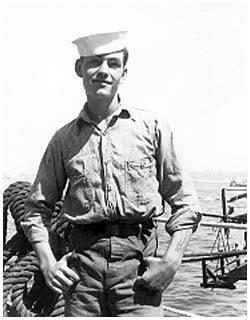 The 600 officers and men aboard two war scarred destroyers which limped into Pearl Harbor this morning are waiting impatiently to put out to sea again with the promise that they will be home for Christmas. 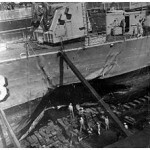 They arrived at 9 a.m. aboard the destroyers Brush and Mansfield, both of which suffered extensive underwater damage when they struck floating mines in Korean coastal waters in September. 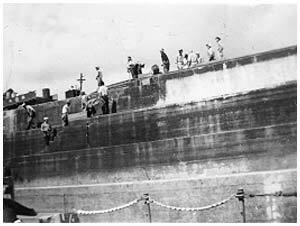 After taking on fuel and supplies the ships are expected to leave late today for San Francisco and then to Puget Sound for shipyard overhauling. 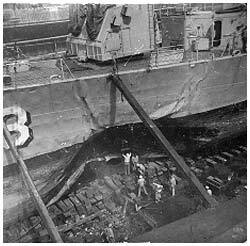 The destroyers left the Yokosuka naval base, Japan, two weeks ago after temporary repairs were made. 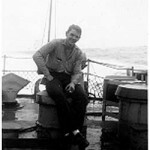 They struggled across the Pacific through the “worst weather I’ve seen in 20 years” on veteran navy man said. 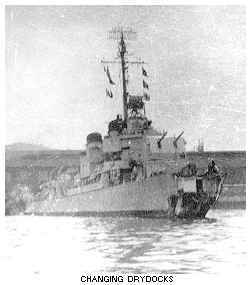 Escorted by the cargo ship Achernar, the destroyers were slowed by the engine damage which the Brush had suffered and by the temporary “false bow” which was fitted across the front end of the Mansfield. 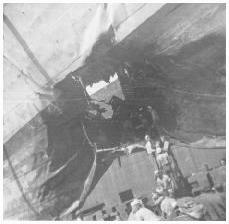 For several days, the ships could proceed at only three knots “because we couldn’t push the waves aside,” said Cmdr. 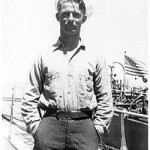 Edwin H. Headland Jr., of Tacoma, Wash., skipper of the Mansfield. 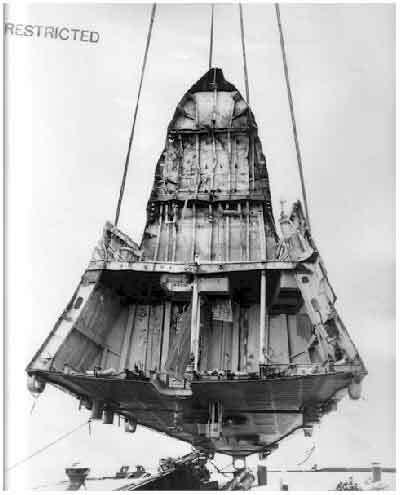 The regular length of the Mansfield is 380 feet but with the temporary bow, she measures only 330 feet. 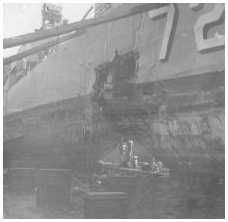 The destroyer lost 65 feet from her front end when her original how blasted by the enemy mine, was removed and sent by navy cargo ship to San Francisco to be repaired. 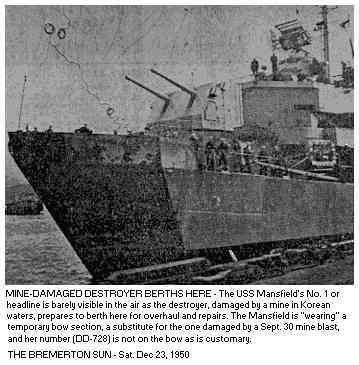 Twenty eight men were injured when the mine exploded under the Mansfield September 30 off the coast of Wonsan. 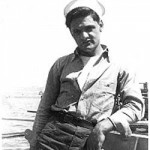 The only life lost was that of the ship’s mascot, a mongrel dog named Pohang. 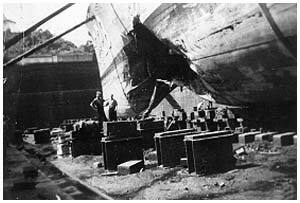 1-The mine exploded under the keel of the ship – the strongest part of the vessel. 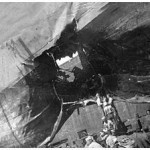 2-“The Mansfield is a lucky ship,” said Cmdr. 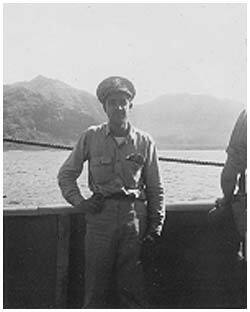 Headland and suffered no damage in the Korean War up to that point. It was one of the “sitting duck” destroyers that paved the way for the Inchon invasion. 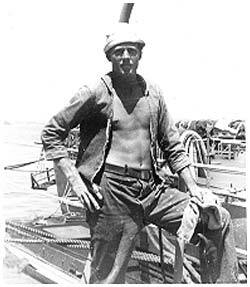 Gunner’s mate 2nd class William L. Corcoran, 26, of Dorchester, Mass., has been recommended for a citation for his part in saving the wounded. 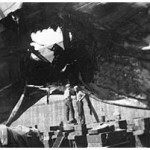 When Brush struck a mine off Tanchon on September 27, nine men were killed and 10 ere injured. 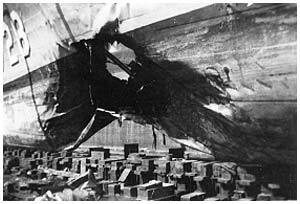 The mine exploded amidship while the ship was traveling at 20 knots. 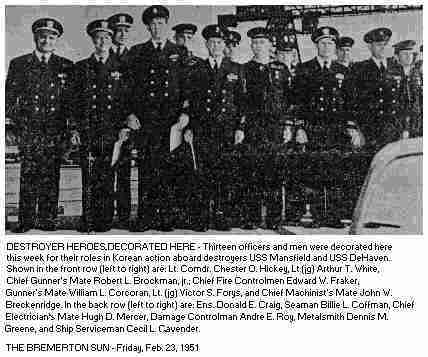 BREMERTON SUN SAT. 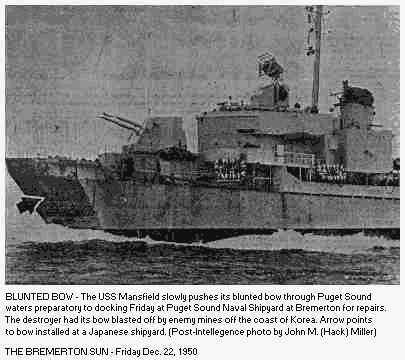 DEC. 23, 1950 – First battle-damaged warships berthing here since World War II – the destroyers USS Mansfield and USS Brush – received warm welcomes yesterday despite rain laden winds. 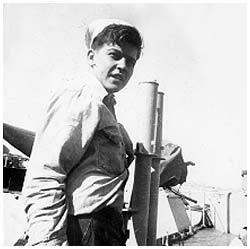 Countless little stories of heroism and humor are bared in the two destroyers’ logs of their important roles in Korean fighting. 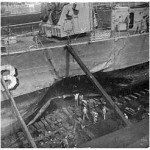 In addition to naval and civilian officials, the 13th naval district’s band was on hand, playing both Christmas and military tunes as the mine-damaged vessels slipped into Pier 4 berths in Puget Sound Naval Shipyard. 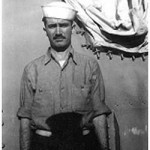 The welcoming was in contrast to that accorded the vessels when they first returned to the states from Korea last week. No public or press reception was held in San Francisco. 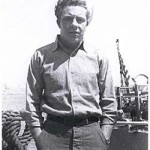 Yesterday, however, both newspaper and movie newsreel cameramen and reporters swarmed through the reception scene. 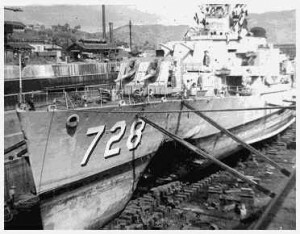 Oddly, the seventh Korean patrol made by the Mansfield flagship of commander destroyer division Nine, was the unluckiest. 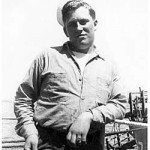 One of the outstanding heroes of the mine blast was William L. Corcoran, gunner’s mate, second class, of Boston, Mass. 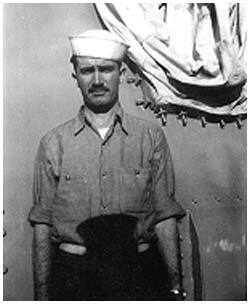 Corcoran, who has been awarded the Silver Star, was credited with saving the lives of many crewmen by removing from the damaged bow area. 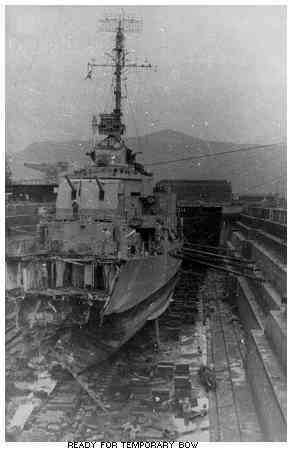 The Mansfield is most famed for her role as on of the five “sitting ducks”. 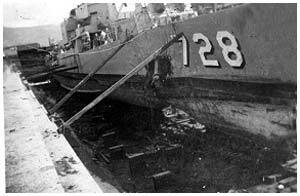 She and sister destroyers stood off Wolmi Island to draw enemy fire – so that guns could be spotted and destroyed – before the successful Inchon landing. 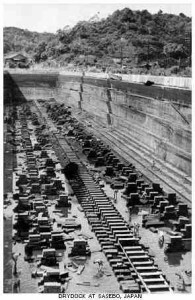 The Mansfield participated in a little mining activity herself, putting ashore on the east coast of Korea, a demolition team which mined a mile-long railroad tunnel. A North Korean train touched off the mines to halt some of the flow of material from northern industrial plants. 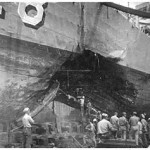 The Mansfield’s damaged bow was removed at the Sasebo, Japan shipyard and a temporary bow was affixed. 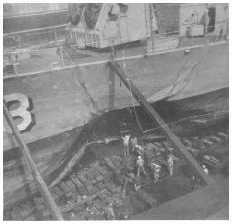 The damaged bow came back aboard a cargo vessel and was transferred to the USS Achernar (AKA-53) for the final leg of the journey here. 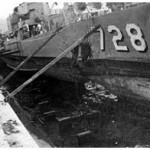 The Brush suffered heavier casualties in a mine blast Sept. 27 off the northeast coast of Korea. The death toll now stands at 13, in addition to the injured and missing. E.N. 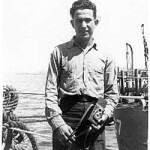 Mitchell, fireman now on leave, was one of the five men swept over board. 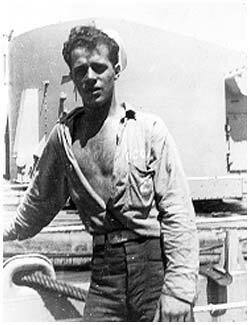 He made a two-mile swim to a small island and was eventually picked up by the destroyer USS Maddox. A second man was saved when he utilized a life raft dropped by a sea rescue plane until a vessel could pick him up. The other three still are listed as missing. 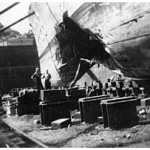 The Mansfield and Brush berthed for repairs of battle damage and general overhaul after discharging their ammunition at Bangor naval ordnance depot. 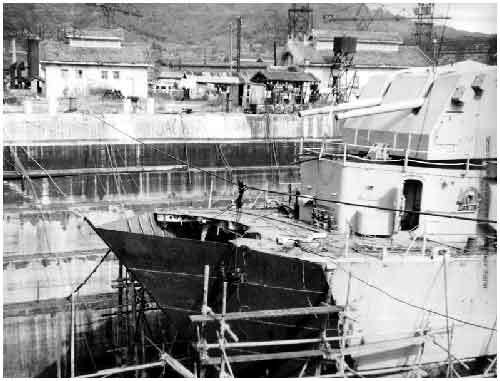 They were the first battle-damaged vessels reporting here since the World War II era when PSNS built, outfitted, repaired and overhauled a total of 394 ships. 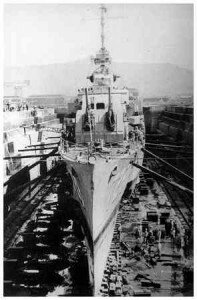 Among them were the “five old ladies of Pearl Harbor,” the battleships USS California, maryland, Nevada, Tennessee and West Virginia. 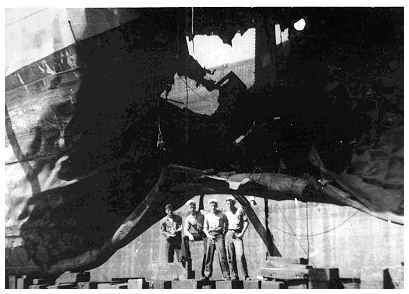 Also, the carriers USS Franklin and Bunker Hill – Japanese suicide plane victims – and the Enterprise, Lexington, Saratoga, Ticonderoga and Wasp. 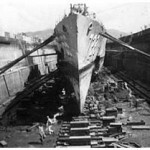 Other battlewagons entering PSNS in wartime were the USS New Jersey, Pennsylvania, South Dakota and Washington, and Britain’s HMS Warspite. 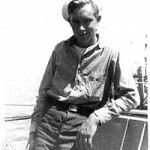 In the cruiser class, the PSNS record lists the Minneapolis, Nashville, New Orleans, Pittsburgh and Wichita. 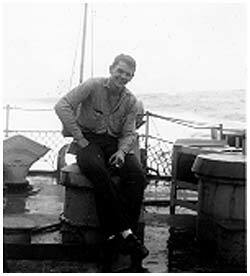 Attention: These pictures were donated by Al Carmichael, a retired Omaha police officer, via Doug Rose. 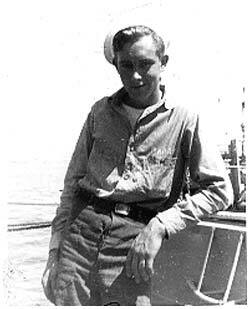 They were taken by a former Mansfield sailor (Mr. Carmichael’s sister-in-law’s husband). 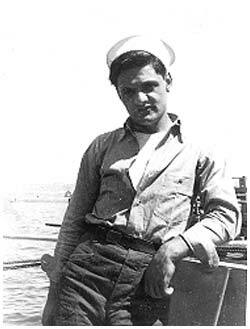 I’m trying to get his name and and any further details. Thanks, Karl. 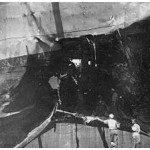 The performance of the ship’s company was excellent in the crisis of a mine explosion on the USS MANSFIELD on 30 September 1950. 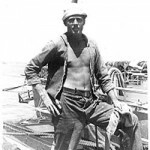 All personnel were stationed in accordance with approved practice and organization. 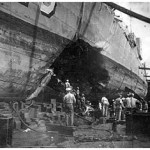 All reports, communication of damage, and repairs were made rapidly and efficiently. 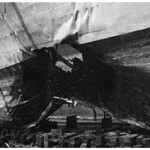 The repair parties reaction to the emergency was an obvious reflection of their training in “Damage Control Problems”. 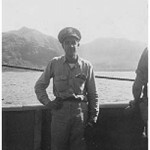 The wounded were evacuated and handled in a excellent manner. 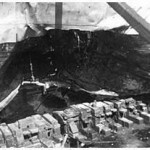 Effective control of flooding was established and the extent of damage was known shortly after being mined. 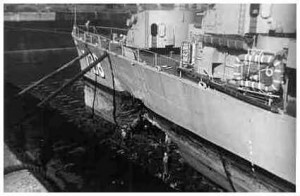 Additional personnel, as needed, were taken from gun stations in the vicinity of the damage, for both rescue and repair work. 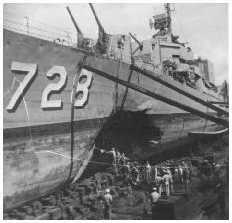 The personnel of the ship had experienced the critical operation of the assault on the Inchon-Seoul area on 13-17 September, followed by continued operations except for two days in port for replenishment on 24-26 September. 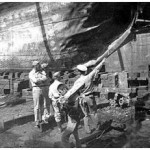 It is considered that their morale was at a high level at the time of the mining, in spite of an arduous, extended underway period. 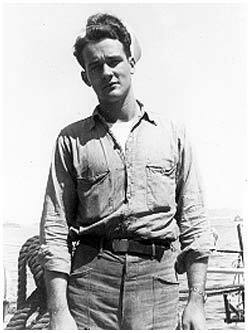 This spirit was sustained, it is believed, by the recognition of the War emergency, by the explanation of the current tactical situation to key personnel, and by daily informal reports of the local operations to all hands over the PA circuit. 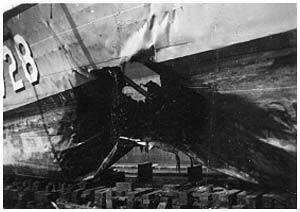 Certain members of the parties performed in the face of possible disaster with a manner which was highly commendable, if not heroic. 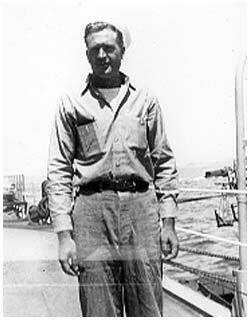 In separate correspondence, recommendations for awards to those personnel will be made, in recognition of their outstanding efforts. 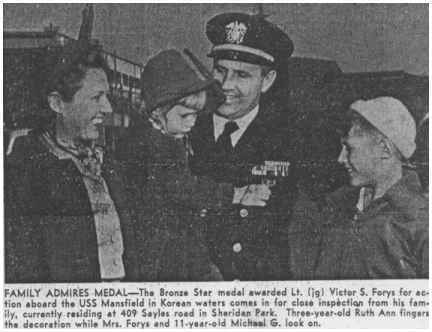 Action in Korean battle areas resulted in 13 more awards, including two Silver Star medals, for officers and men here while their destroyers are being repaired in Puget Sound naval shipyard. 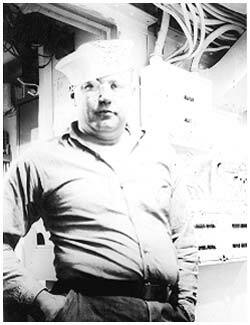 Read Adm. Hugh E. Haven, shipyard commander, made the awards wednesday during ceremonies held near the ships under repair. Silver stars were conferred upon Lt. Comdr. 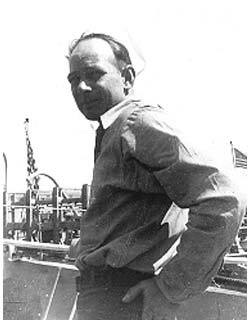 Chester O. Hickey of National City, Calif., and GM2 William L. Corcoran of Dorchester, Mass. 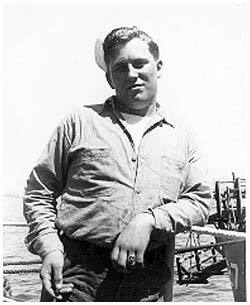 Both were decorated for their roles in evacuation of wounded comrades from the explosion area when their ship, the USS Mansfield struck an enemy mine Sept. 30, in North Korean waters. 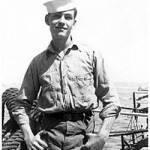 Gunner Corcoran was cited for entering the devastated chief petty officers’ mess area and working heroically until he himself collapsed of wounds. 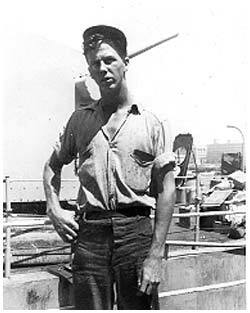 Action by the Silver Star winners in getting timely medical aid to the 28 injured Mansfield crewmen was a factor in saving of all casualties’ lives. 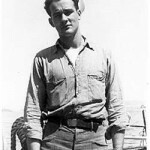 Seven other Mansfield officers and men were decorated as result of their roles in the same incident, including Lt. (jg) Victor S. Forys, 409 Sayles Road, CMM John W. Breckenridge, Savannah, Tenn., and SN Billie L. Coffman, Tucson, Ariz., who received Bronze Stars with combat distinguishing devices. 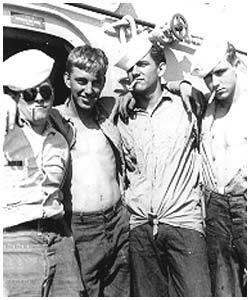 Commendation ribbons with combat distinguishing devices went to CEM Hugh D. Mercer of Bolivia, N.C., DC1 Andre E. Roy of Chelsea, Mass., and ME2 Dennis M. Greene, San Diego, Calif.
Ens. 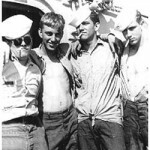 Donald E. Craig, San Diego, Calif.; GGM Robert Lee Brockman, Jr., San Diego, Calif.; CFC Edward W. Fraker, Ocean Beach, Calif.; and Lt. (jg) Arthur T. White, La Jolla, Calif. The following is a copy of the Citation presented to LT CMDR HICKEY for his Silver Star Medal. 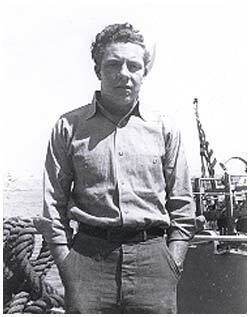 Courtesy of his son, Roger Hickey. 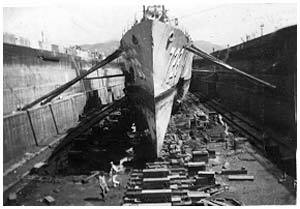 Taken in dry dock Sasebo, Japan. 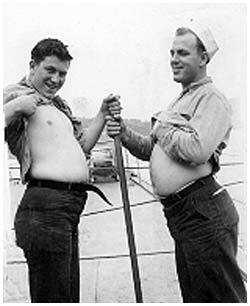 Japanese yard workers assembled for briefing on bow removal. 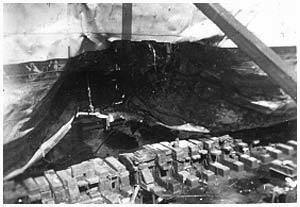 Severe mine damage below water line from mine explosion. 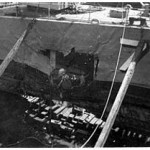 Bow being separated from main part of destroyer. 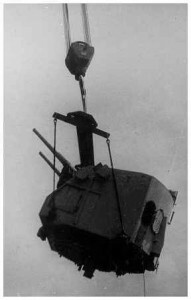 Bow being removed by crane. 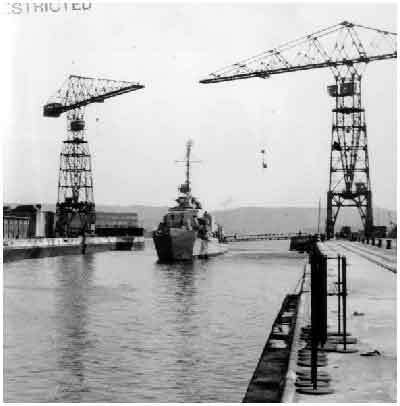 Underway after completion of repairs. 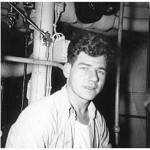 The following pictures courtesy of BT1 Jack Ray Huffman [deceased] (47-51). 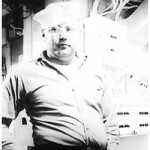 Donated by his son Darrel Huffman for use on this website and for the archives of the USS Mansfield Association. 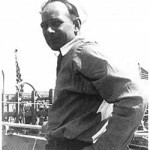 DISCLAIMER: ALL NAMES AND EVENTS WITHDRAWN FROM A 50+ YEAR OLD MEMORY BANK!